Knowing how much our family likes our bacon cheeseburger roll-up, I decided to create a chicken and broccoli roll-up recipe. I've made this chicken roll-up a few times now and thought it was time to share it with you. You can use canned pizza crust or a 20-minute (total) bread dough recipe for the roll-up, depending on your time constraints and preferences. Combine the cheeses, vegetables, and seasonings together. Set aside. Roll out the dough (either kind) on a lightly floured surface. Spread with the cheese mixture leaving the outer inch without cheese. Place the chicken on the cheese mixture, spreading it well. Roll the dough beginning on the long side. Pinch the sides and seams together. If using the homemade dough, arrange the roll-up in a "U" shape on a cookie sheet. Parchment paper makes this even easier for clean-up later. Cut a few slits in the top to allow steam to release. Bake at 400° for 15-20 minutes. Allow to cool for a few minutes before serving. 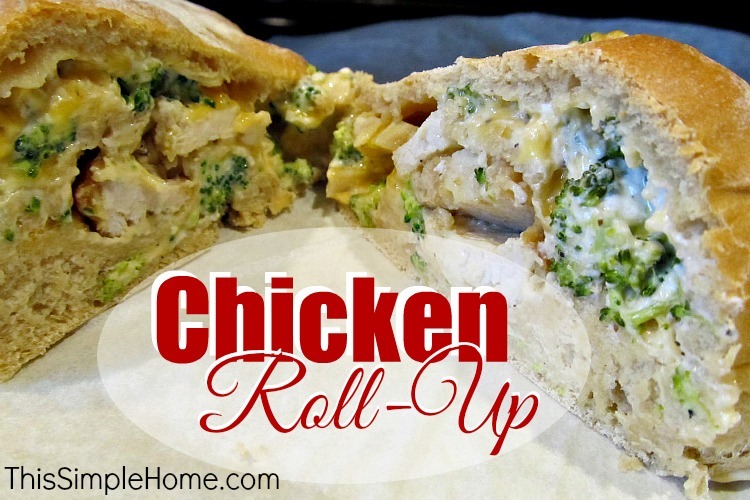 Cut the chicken and broccoli roll-up diagonally if desired.